Facilitators will benefit from training that will change them as they prepare to serve other. 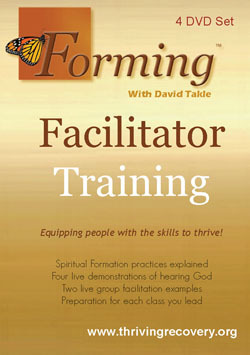 The Forming Facilitator Training Video includes two DVD�s. Session 1 � Changing our Minds about Change � Learning how to engage with God for change instead of trying to make it happen through our own efforts. Session 2 � God is Relational � Understanding God�s best intentions toward us are to build a working relationship with us, rather than judge our every move. Session 3 � 4 - Developing a Conversational Prayer Life � Learning how to listen to what God wants to share with us about life? Session 5 Grace is Actually a Means for Transformation � Understanding grace is not only how we become a Christian, it is also how we grow as a Christian. Session 6, 7, 8 � Ways to Engage with God for Change � Engaging actively with God and how to balance our part and God�s part in this process? Session 9 � Renewing Our Minds � How to engage with God in ways that actually change how we see and think about all of life? Session 10 � Healing Our Identity and Self-hate � How to engage with God to heal our distorted self-image? Session 11 � Disarming Our Fear � How to engage with God to disarm our fears and build our trust in God? The Forming Facilitator Training DVD Package is discounted as part of the Forming Open Group License Kit. Facilitators should consider attending facilitator events and keep informed by checking thrivingrecovery.org and signing up for a newsletter. ***Note - This item is available for license holders only. If you already own an Open Group License you will be able to purchase this product for $195.